Extracting extended bass frequencies from compact loudspeaker cabinets is a balancing act that has challenged designers for decades. radiator on top of the cabinet. This assumes the role that’s ordinarily undertaken by a port and acts to maximise efficiency while at the same time increasing the radiating area. The Demand D9 is the middle of the three models, measuring 165 x 297 x 304mm (WxHxD). and uses a 133mm mid/bass driver partnered with a 25mm dome tweeter, while the bass radiator is oval-shaped measuring 228 x 127mm and sits beneath a fixed grille cloth on top of the cabinet. 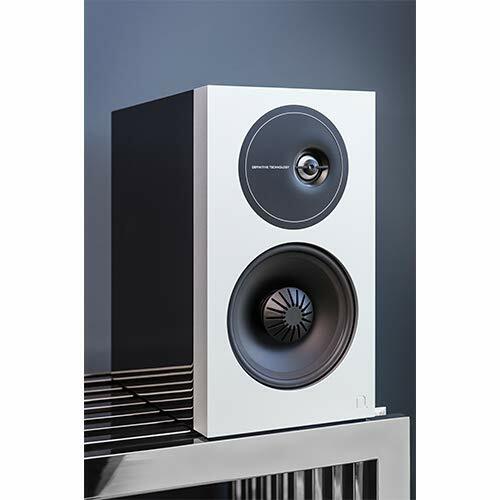 Although the radiator is the more unusual part of the two-way loudspeaker design, the main drivers themselves are also not entirely conventional. The mid/bass driver is a polypropylene design that uses what Definitive Technology calls Balanced Double Surround System (BDSS), which is borrowed from models further up the range to facilitate longer driver excursions along with a distinctive mushroom-shaped central phase plug. 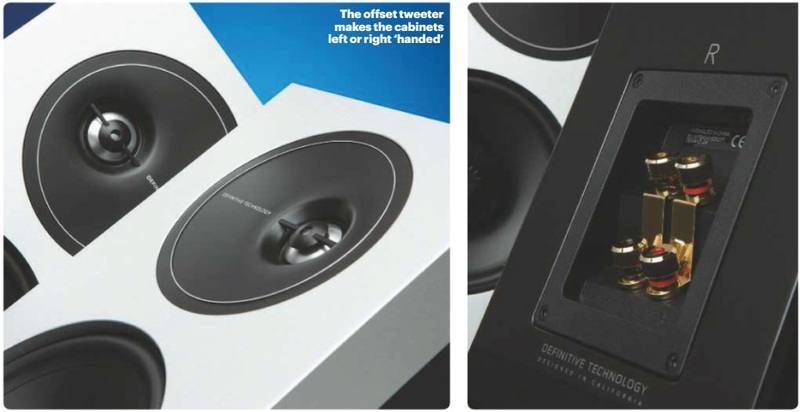 The tweeter is an aluminium dome and the whole assembly is offset in the front baffle, effectively making each cabinet either right or left ‘handed.’ Definitive Technology says that by doing this and combining it with a ‘wave alignment lens’ creates a smoother high-frequency response that’s intended to improve dispersion. 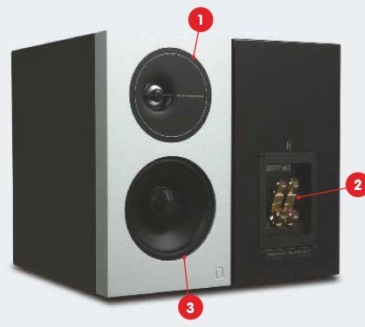 The imagery in the supplied literature suggests that the speakers should be positioned with the tweeters facing outwards, so this is precisely how the Demand D9 is tested. The combination of these various design decisions means that this is a distinctive-looking standmount loudspeaker. Some parts of the styling are a question of personal taste – the tweeter housing looks uncannily like the Death Star from Star Wars to my eyes – but the overall styling is pleasant enough. 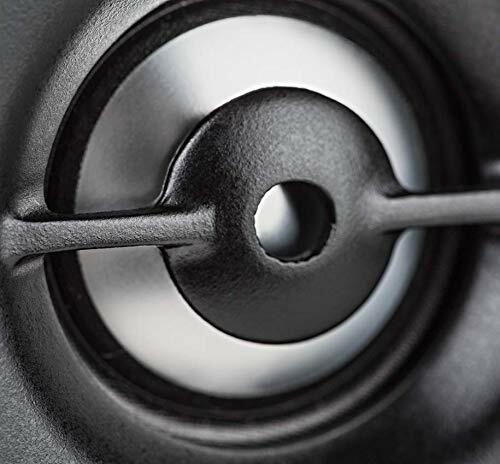 Magnetic speaker grilles are supplied to cover the front drivers and the bass radiator on top of the cabinet is hidden behind a fixed grille. 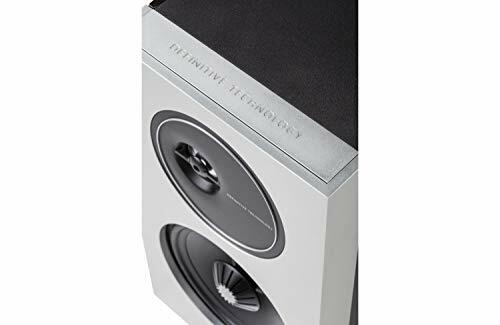 The drivers are mounted in an inert three-layer front baffle that uses extruded aluminium, and the standard of build is good if not outstanding for the asking price. 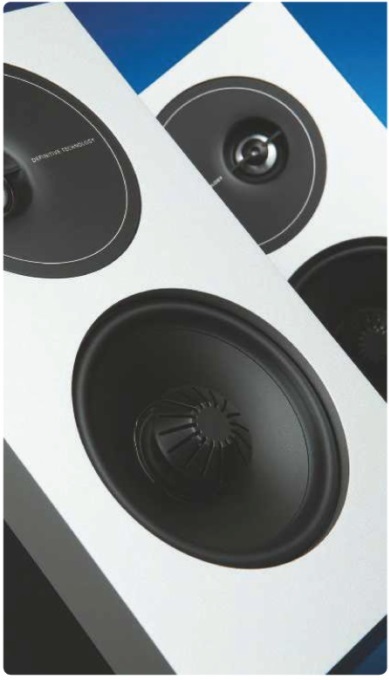 The multi-layered black or white finishes are polished to a high gloss and should fit with most domestic situations, while other points of contact like the speaker terminals feel solid and carefully implemented. Available in high-gloss black or white finishes to act directly against surfaces and there is very little sense of energy being radiated anywhere other than where it should be. 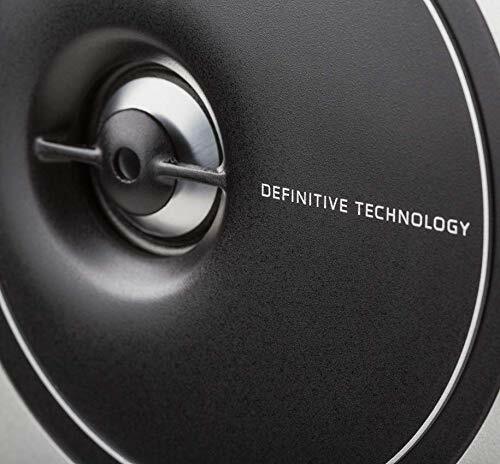 Connected to a Naim Uniti Nova all-in-one system, the Demand D9 sounds rather bigger than its slender profile might suggest. The presence of that hefty radiator does imbue it with consistently impressive low end – the laws of physics haven’t been tom up by its presence, but there is a convincing weight to the lower registers that really helps larger scale material to sound bigger and more capable of filling the room than I expect. The wonderful swell present in Emily King’s Forgiveness is well integrated into the rest of the frequency response and just about moves into the threshold of being felt as much as heard. Importantly, there is no sense of the sluggishness that can sometimes accompany passive bass radiator designs – that feeling that the radiator is half a beat behind the main drivers. Instead, the radiator works in unison with the forward-facing drivers here. The complex, fast moving Ode To The Big Sea by The Cinematic Orchestra moves with the flow and rhythmic engagement that it needs and combined with the depth on offer, makes for a compelling listen. soundstage on offer. What really helps is that it grows and shrinks in a believable way depending on what you happen to be playing at the time. The lovely, White Star Liner by Public Service Broadcasting is reproduced with a tremendous sense of space that gives the orchestra and supporting electronica the room it really needs to breathe and work together. The more constricted and congested Girls by Tricky keeps the deliberately narrow and aggressive delivery in place, highlighting the fact that it’s far from easy to wrong foot the presentation. While it might be fair to describe the treble as ‘well lit’, it is also hard to provoke it into sounding in anyway harsh or overly forward. The limitations of the Demand D9 start to make themselves known in the upper midrange. It never feels recessed, but struggles to pull fine detail of out Dead Can Dance’s Dionysus, which can hinder how it reproduces voices and some instruments. But this is easy to overlook when you consider the sense of fun it brings to performances that makes it a very pleasant partner to spend hours listening to. 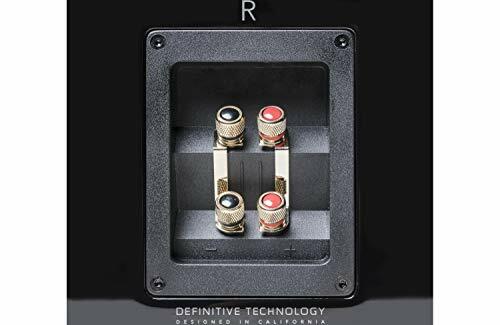 If your musical preferences lean towards electronic material in particular, the Demand D9’s potent low-end extension, sense of agility and timing is very engaging indeed and has me enjoying whole albums rather than just listening to single test tracks. 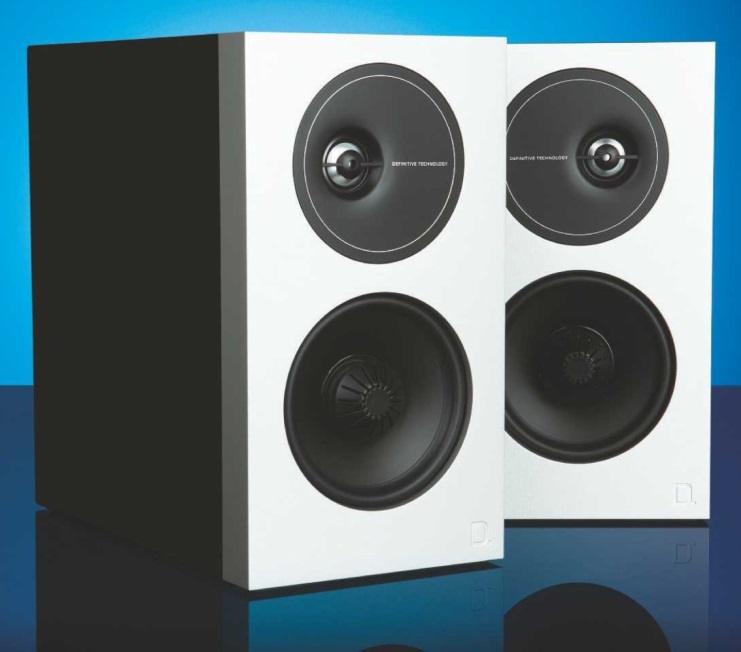 Definitive Technology might be new to UK shores, but the Demand D9 makes a highly compelling case for itself at the price. It generates a more than respectable low end from a slimline cabinet while remaining easy to drive, simple to place and capable of impressive rhythmic ability with a wide selection of music. Able to generate big, entertaining performances with apparent ease, it will surely make many friends. 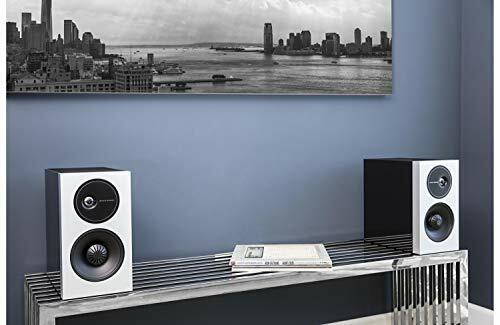 Bowers & Wilkins’ 707 S2 (HFC 438) is a more conventional design than the D9 that can’t quite match its bass extension and is slightly more demanding of placement near walls. But it hits back with one of the most natural presentations for a standmount and crucially, manages to do so while being just as much fun to listen to as the D9. The Definitive Technology is a good speaker, but the 707 S2 still remains the class act of the field.